Introducing the LPX-60 3D laser scanner, designed to deliver all the precision of Roland's larger, more advanced LPX-60 in a compact, affordable device. Designed for ease of use, the LPX-60 can be controlled from a single button and comes complete with user-friendly scanning software that creates high-quality digital data from a wide variety of objects. The LPX-60 is ideal for reverse engineering and the design of small items including the capture of prototypes. 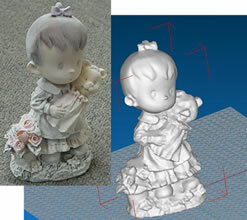 Its unmatched ease of use allows virtually anyone to create 3D files without a lengthy learning curve. The LPX-60 features a new scanning head with an aspheric lens, and improved laser triangulation resulting in increased object coverage. 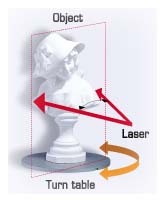 And the rigid frame construction ensures high-quality scanning at a minimum of 0.2 mm (0.008“) pitch. This precision head is ideal for capturing the surface details of an object. Thanks to its dual mode capability, the LPX-60 lets you choose Rotary mode for rapidly scanning spherical and smooth-surfaced objects, or Plane mode for capturing flat areas, oblique angles, and fine details. The LPX-60 incorporates a unique compact design that fits right on the desktop. This manageable size is large enough to accommodate objects up to 203.2 mm (8”) in diameter x 304.8 mm (12”) in height. The LPX-60’s quiet operation makes it ideal for office use. maximum head movement speed: 50 mm/sec. * Use the included USB cable. Never use a USB hub or the like.